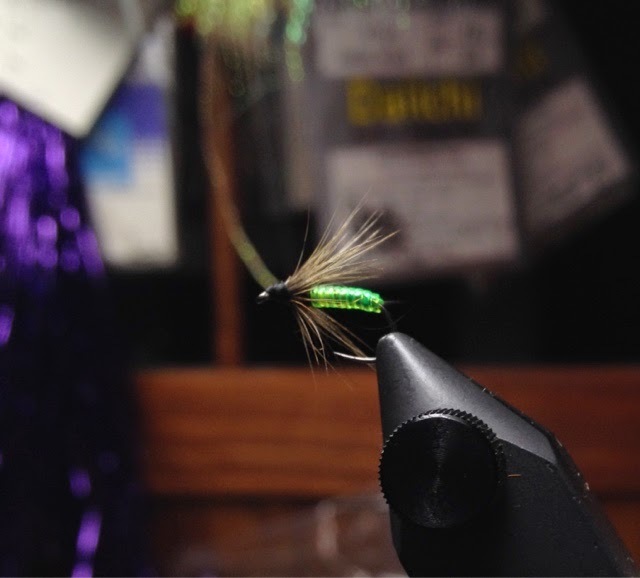 I fish soft hackles pretty often, usually just put a hackle on one of the standard nymphs I use. In this case I'm putting a hackle on a very basic Green Rockworm pattern. Hook, Allen 102BL or any similar hook, I really like wide gape barbless hooks and so that's what I use. Your standard nymph hooks will do a fine job as well. Underbody of opal or pearl tinsel. Body is vinyl D-rib green but use any color you like! Hackle, genetic hen. I typically use a sort of speckled dark dun or grizzly. Black would be fine too! I like a oversize hackle as you can see. Dubbing, black, either SLF or Life Cycle. Thread is, as usual, Veevus 14/0. I like start the body a little bit down the bend for this fly when using this type of hook, gives a nice effect.